Discussion in 'Other Systems' started by bdbits, Jul 25, 2018. Lots of hype, little substance. Yes, there will will be a new mount (big step for Nikon) and an adapter for existing lenses. I read a release on this yesterday. I left Nikon for Sony and plan to stay with Sony. I'm a died in the wool Nikon guy. I think they'll have a hard time selling it if it doesn't compete well with the A7iii. I really enjoy my Sony's with my Nikon lenses and others too. It'd really have to be something special to kill my desire for an A7iii. At least they're being smart enough to develop an adapter for the new mount so the old F mount doesn't go obsolete. They know what has buttered their bread for a lot of years, lens loyalty. I'm still a Nikon guy. I've been shooting with my Sony bodies more lately, but mainly because they excel better in portrait work. I still prefer Nikon flashes, lenses and image rendering so depending on how things go, I might consider switching back to Nikon mirrorless if they get it right. What I have read mostly says it will be more expensive than Sony. I think both Canon and Nikon will produce solid but feature-poor bodies relative to Sony, or m4/3 bodies for that matter. In any case, I am not interested in moving outside Sony for the near future. I'm just curious to see how many lenses they will come up with initially. Every mirrorless entrant started out with a few lenses and if Nikon follows that pattern, they'll need quite some time to catch up with Sony. I have used Nikon gear in the past but I don't think they will tempt me to switch within the next 3 years or so; every mirrorless entrant has needed several years for a reasonably mature product line so far. Presently, Nikon has nothing to offer me, nor remotely affordable that I may desire, ie. 500-800mm telephotos, to warrant switching to Nikon. Nor does Canon. I concur with Ad. Sony product line offers maturity. Nikon and Canon will require their loyal base to play beta testers for their initial foray into FF mirrorless. Not a fanboy of any brand. Sony happens to occupy the top spot for camera system with the most feature set. Aside...I personally hope Pentax would enter the mirrorless market too. Hate to see the demise of that brand. A mirrorless version of the K1 would be interesting. Nikon don't have the luxury of testing tech on APS-C before moving to FF where the product cycle is much longer, so there's a lot of stuff banking on this. It's now clear why they threw everything into the D850: They're moving emphasis to mirrorless so they made a knock-it-out-the-park DSLR to last their professionals a long long time. However, I doubt they'll be able to do better than the 5 lenses Sony announced at launch of FE - a kit lens, fixed aperture 24-70 and 70-200, and a couple primes, but the lens roadmap will be very interesting. But anyway, I'm glad this is happening, the competition can only be good for Sony. I like to see competition. But Nikon has a big hill to climb, to catch up with Sony, or even Fuji or Oympusonic. I think they'll come out with a good camera, equivalent to A7III but too expensive and not enough lenses. Sony really did roil the market with the A7III. I predict Canon will step on their wangs somehow. Probably by forgetting to include video or something. Knowing Canon, they'll probably come out with a half-arse FF mirrorless lacking 4k and a bunch of other features, yet still manage to get the bulk of FF mirrorless sales! This just occurred to me - is the new Nikon mirrorless going to have a Sony manufactured sensor? In my frustrations with Canon & Nikon I once thought they were being lazy and foolish, but their strategy makes more sense to me, now. Go ahead and lose a relatively small group of early MILC adopters, wait until the benefits have sufficiently multiplied and the drawbacks have diminished, then get in before the trickle of MILC defectors becomes a mass exodus. I think such an exit may well have taken place if Canon & Nikon had continued to sideline MILCs for another 10 years, but it seems unlikely now... unless they really mess it up. I look forward to seeing how this fresh competition affects future Sony models. I still have some affinity for Nikon from the film days and Canon from the early digital days. But it's been Sony who has been really pushing the envelope to put state of the art MILCs within my grasp. It will take some real doing to make me forget that. You guys might think I'm heretic, but I do still prefer Nikon colors and lenses. I just did 3 back-to-back shoots with my Sony bodies and the 28 + 85. Pictures turned out great, but I much prefer the warm and contrasty colors from Nikon over Sony. Sony leans too cool for my taste with native lenses. I think I tend to prefer my adapted Nikon glass due to the warmer color signature. You guys might think I'm heretic, but I do still prefer Nikon colors and lenses. 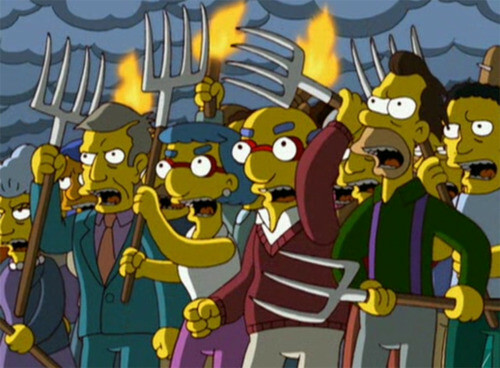 We're on our way to LA with torches and pitchforks as I type. I tend to use non-Sony lenses myself. It is practically a hallmark of the Sony user base to enjoy different lens vendors. Different lenses definitely produce different results, like colors, and sharpness, contrast, etc. From what I have read, Sony actually produces a more neutral color than others. I think some of our preferences are what we first learned on, or the pictures we enjoy and know what was used to create it. Nothing wrong with any of this. I like to think photography is still an art form among those who go beyond smartphones (and even some of them), so the variety is a good thing. I think Sony is going to maintain a technical edge and a more attractive price point, on bodies anyway. I hope so. They've known this would happen eventually, and I am sure they have plans to keep their hard-earned market share as much as possible. Might be a good thing for us as consumers. Time will tell. I've experienced this with Canon. Even with a RAW workflow and calibrated profiles, the colors & contrast seem inherently more inviting for many more conventional types of scene. If that were my bread & butter I could see that having some real sway. I could see myself holding out another 6 months to go MILC then dealing with some 1st generation gremlins, just to keep that continuity of look. As it is, I catalog & sell my glass art online for a living. For that application, the tweaks that work so great for skies, foliage and people seem to get in the way a little with my vases & paperweights. So I actually prefer Sony's approach for what I'm doing. I'd be interested to see how well the new Canikon ML FF bodies handle M-mount lenses, wide angles without smearing or the need to do Kolari surgery like I did on my A7R. I will probably have to rent a body sometime down the road to find out, assuming someone makes an adapter.